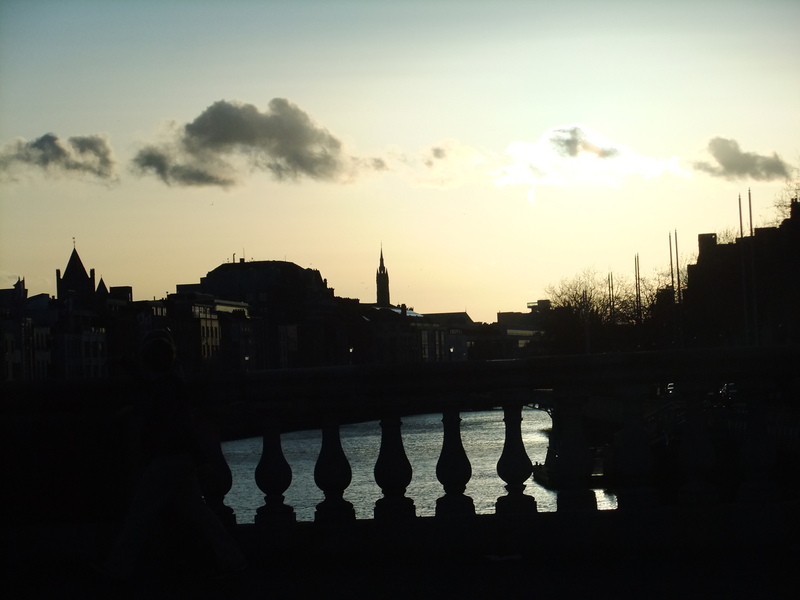 The Adventures of a Bible – A True Story set in Dublin, by the Rev. J.H. Townsend, D.D. This is the title of just one of the tracts which I recently obtained from “Way of Life”, Dungannon, copies of which are also available from “Good News for Ireland,” 5 Rathina, Newcastle-West, Co.Limerick. On a dull January afternoon some years ago – the date of this occurrence is written down in an old notebook of mine – a young widow was sitting in her drawing room looking out of the window. It was a fine house in a fashionable Dublin square; the room was handsomely furnished, everything indicated comfort, and even wealth, but the possessor looked unhappy. Mrs. Blake was a Roman Catholic, fervent and conscientious in the practice of her creed, but of late her mind had been burdened with the thought of her sins. Religious practices, penance, and even prayers, brought her no relief; the burden could not be removed. She had told her sorrows to her confessor, and at his bidding had taken up works of charity; but, although these things were an interest and for a while occupied her mind, the sense of her own sins lay heavy on her soul. Her confessor, a kindly and attractive young priest, gave her full absolution, but his words brought no comfort. The young priest explained that a Society entertainer well-known at that period, was to appear before a fashionable audience, and that in his opinion this would be the best thing for her. No protest was of the slightest use; she could not disobey her spiritual advisor, who had even bought her a ticket for the performance, so the following afternoon saw Mrs. Blake at the appointed place, where large placards announced the entertainment which she had been ordered to attend. The Rotunda, as every Dublin person knows, has more than one public room under its roof; there is the great Round Room, the Pillar Room, and one or two more; there are, moreover, different entrances. Now, as it happened, Mrs. Blake had made a mistake as to the hour of the performance, and instead of the crowd which she would have seen had she come at the right time, she noticed a little string of persons entering the building; following them she found herself in one of the smaller halls and sat down. It seemed odd that no one had asked her for a ticket, but she concluded that this would be rectified later on. There was no time for much thought, as almost immediately a gentleman came upon the platform and gave out a hymn. Then it flashed on her that she had made some dreadful mistake – she must be in the wrong room, and, worst of all, this must be some Protestant meeting into which she had unfortunately found her way. Mrs. Blake was shy and sensitive; to go out of the place in the sight of all assembled was to her an impossibility. What should she do? She determined to slip out at the close of the hymn, for by doing so her action would be less likely to attract notice. This she tried to do, but in her anxiety to be quick she knocked down her umbrella violently, and the noise which it made was so great that many turned round to see the cause. Poor Mrs. Blake, terrified at what she had done, sank into a chair and almost wished that she could fall through the floor. Now there was a deep silence, and then one voice, that of the man on the platform, was heard in prayer. 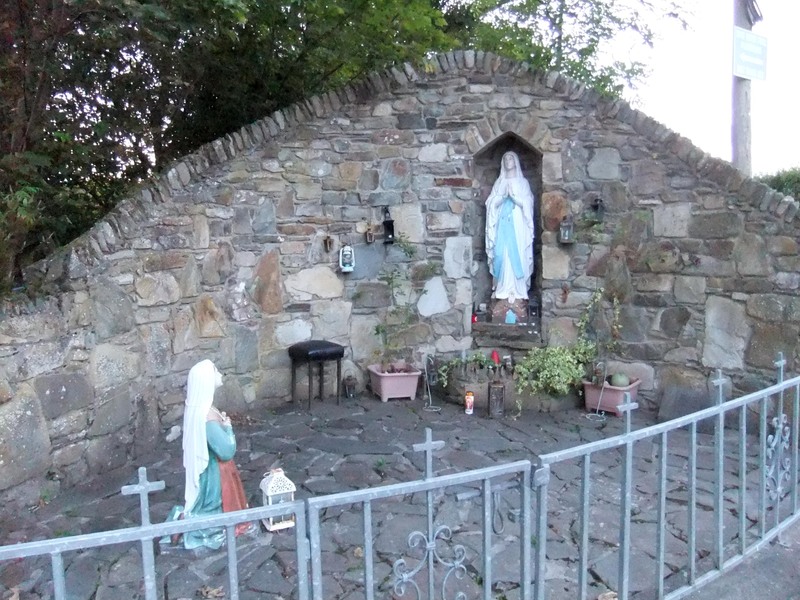 She could not help listening, as she had never heard anything like this before; it was so unlike the “Hail Marys” and other prayers in her books of devotion. The man was so reverent, but he seemed so happy as he prayed! This struck her as most extraordinary. The prayer ended and the speaker announced that he would read a passage of Scripture on the “Forgiveness of Sin.” The very subject of all others in the world that she longed to hear about! Come what may – let Father John say what he liked or do what he chose – she must listen to this. The first eighteen verses of the tenth chapter of the Epistle to the Hebrews was read, and the speaker in a simple way expounded the teaching until it became as clear as daylight. The One Sacrifice once offered; the free and full forgiveness granted to those who ask for it in His Name; this, illustrated by several other passages in the New Testament, formed the subject of the discourse. As the thirsty ground drinks in the summer rain, so did this poor soul receive these wonderful truths. She had never heard them before, but now they flowed into her inmost being and she longed to hear more. The speaker ceased, and after another prayer the meeting broke up. Mrs Blake felt that this was the opportunity of her life, so, summoning her courage, she went to the edge of the platform and asked the gentleman whose words he had been reading. Mrs. Blake thanked him warmly, and hastened home with joy in her heart and a new light in her eye; how different a being from the disconsolate creature who a couple of hours previously had found her way to the Rotunda! For the next few days everything was forgotten but her new treasure; she read and re-read the marked passages and many others too. The Light shone into her understanding; the burden long weighing upon her conscience rolled away into the Open Grave, and the peace of God filled her heart and mind. Now the time had come for the Bible to be returned. Once more she was deep in her new study and so engrossed in thought as not to notice a ring at the hall door. Someone entered her sitting room and her confessor stood before her. He noticed two things: an embarrassment in her manner, and at the same time a restful calm in her eyes, to which he was a stranger. Taken aback by the suddenness of the whole thing, Mrs. Blake lost her self-possession. She had intended to keep the matter a secret for a time at least, but now she was off her guard, and with the simplicity of a child she told the whole story – the mistake of the room, the attempt to go, the words spoken, the book lent, and, last of all, the joy and peace that filled her heart. With downcast eyes she spoke, but when she glanced up, her spirit froze with terror at the look of the man before her. It was black with rage! Never before had she seen such fury depicted on a face. “Give me that book!” he said hoarsely. “It isn’t mine” she cried, vainly attempting to stop him. Seizing it as he spoke, he thrust it into his pocket and, giving her a fearful look strode out of the room. The lady sat as if paralyzed – she heard the hall door shut, and something in her heart seemed to shut also and to leave her alone in terror. That awful look searched her through and through; only those who have been born and brought up in the Church of Rome know the nameless horror which their idea of the power of the priesthood can inspire. Then too she thought of the gentleman who had lent her his Bible; his address was in it, but she could not remember it and knew not where to write. This was very grievous, but oh! that look – it was branded on her memory. Days passed slowly by, but her visitor, once so welcome, now so dreaded, did not return. Courage began to creep back, and at last, after a fortnight or more had elapsed, Mrs. Blake determined to venture upon a visit to him. She must make one more effort, if not too late, to get the book restored to its rightful owner. Father John lived at some distance from Mrs. Blake’s residence, and his house adjoined a convent to which he was confessor. The door was opened by a nun, who visibly startled at the sight of Mrs. Blake and, upon being asked if the priest was at home, her eyes seemed to blaze for a moment, but immediately her face became rigid and her manner cold as she said, “Yes, Father John is at home – he is in this room; will you not come in and see him?” As she spoke she half led, half pushed, the lady into the room opening off the hall; but as the visitor entered she uttered a piercing shriek, for oh! – horrors of horrors! – there was an open coffin, and in it the lifeless form of her confessor. Before she could recover from the shock, the nun glided up to her and hissed into her ear these words: “He died cursing you; you gave him a Bible, and he told me to tell you that he cursed you – cursed you with his last breath; now go!” And before she well knew what had happened, Mrs Blake was in the street with the door shut behind her. Several weeks elapsed. The breath of spring had passed over the earth, waking leaves and flowers to life and loveliness. One evening Mrs. Blake was sitting alone preparing over the events of the past three or four months. The joy of pardon was in her heart, she had bought a Bible for herself, and had read it daily. The old errors in which she had been brought up had been one by one renounced, but there was a sorrow which could not be effaced. How sad, how ineffably sad, the brief illness and sudden death of the young priest! His last look! His last words! That terrible message! At that moment the servant ushered into the room a lady who was closely veiled and who stood for a moment irresolute. Before Mrs. Blake could speak, the other said, “You do not know me in this dress, but you will soon recognise me.” With these words she lifted her veil and revealed the face of the nun who had delivered the message of cursing as they stood by the open coffin. A brief farewell and she had passed out of the house and was gone. Was it, after all, only a dream? A little worn Bible lay on the table before her. It was no dream, but a glorious reality. That little book – without a living voice to expound its teaching in two of these cases – had brought three precious souls out of darkness into light. Imagine the feelings of the owner when it was restored to him with this wonderful record! And yet what says the One who sent it on its mission? Reader, what has your Bible done for you? On The Trinity College Dublin Book Sale 2012 – and Never Judging a Book by its Cover! 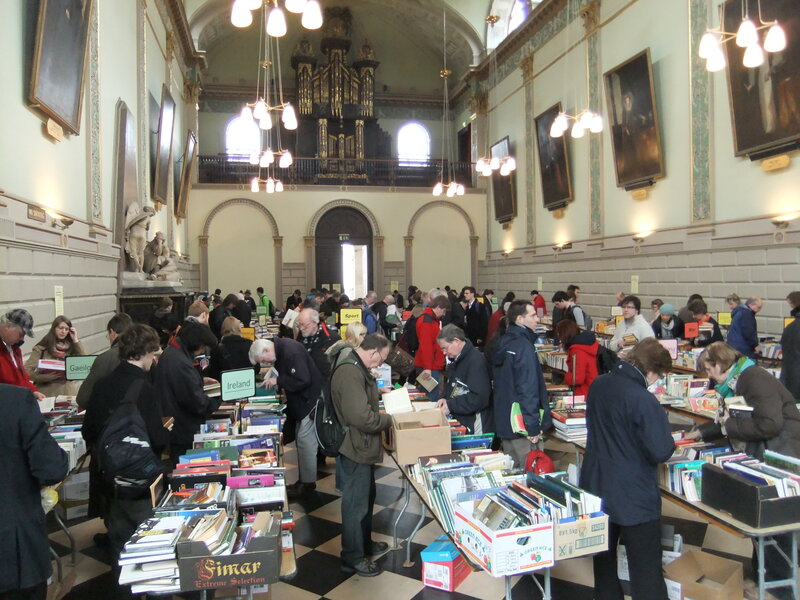 On Friday 9th March last I made my way into Dublin by train for the twenty-third annual second-hand book sale in Trinity College. First held in 1989, this sale raises funds for the college’s libraries. Antiquarian, rare books and journals are all auctioned off prior to the sale but some books of interest were still remaining when I reached there that Friday morning. I have previously discovered out-of-print Christian books, including the writings of John Wesley, but one thing I have learned from this year’s book sale is that where ‘Christian’ books are concerned, you can never judge a book by its cover! I discovered a certain book which I thought would be a gem but later at home, when I tried to read it, I realised that there was something terribly wrong. Somehow it was too full of the writer’s own philosophies and although he quoted some wonderful scripture from 1Corinthians 13, I could not relate to his own words which felt strangely alien to me. When the 19th century writer proceeded to quote from a well known humanist of the time, I realised that I had made a mistake in buying the book – even though it was only 50 cents! So many books in the world and so much knowledge… yet only the written word which is written about, or seeks to glorify the Lord Jesus Christ will pass the “hay, wood and stubble” test. And only the actions which spring from hearts that are filled with His love will stand on that day. My prayer is that the He will give me discernment in all that I acquire to read, or to listen to of a spiritual nature. I was struck by these amusing newspaper headlines recently… “Somewhere in Ireland a Burglar has the Heart of a Saint.” The heart in question was reported to have belonged to Laurence O’Toole, “patron saint of Dublin” who was canonized in 1225 by Pope Honorius 111. Laurence O’Toole’s preserved heart had been displayed in Christ Church Cathedral since the 13th Century and it appeared that whoever had stolen it had no interest in financial gain since they had ignored other artefacts made of gold in the vicinity. The cathedral’s director of operations described the recent theft as “completely bizarre.” Why, indeed, should anyone want the ancient remains of another human being? My mind travelled back a few years to the time when the ‘relics of St. Theresa’ had been brought around Ireland and somehow I felt that I knew a possible answer to that question. I believe that many people have a desire to possess something that they superstitiously believe may bring them ‘good luck’ – yes, even if they have been stolen! While giving out tracts of a former priest’s testimony at the viewing of these ‘relics of St. Theresa,’ I was awed by the large crowds of local people who had eagerly been queuing for some time to see the relics. (9) “Thou shalt not covet thy neighbour’s wife. As we read God’s Word in both the Old and New Testaments we are left in no doubt that He hates idolatry. To ignore such a large portion of scripture, one that commands that we shun idolatry, is a very serious matter indeed. Every one of God’s Ten Commandments are as valid today as they were when they were given thousands of years ago and my prayer is that dear souls for whom Jesus shed His precious blood would have their eyes opened to the great sin of idolatry, amongst others that are condoned by Roman Catholicism. You are currently browsing the Elizabeth Burke's Blog blog archives for March, 2012.